Some weeks ago, we decided to buy a hydraulic top link for our Agrotron tractor. It is a good tool when you have heavy implements... if you would like to regulate your implements it could be a hard task when you use a mechanical top link. For small tractors, we think that hydraulic top link is not so important. Nevertheless, it is a good help if you need to move the implement when you are working. For us, when we use our seed drill or chisel plough we had problems with our mechanical top link. When tractor has mechanical hydraulic valves and you have to fix your hydraulic top link it is a really complicate task. Firstly, you have to fix the implement on tractor's arms and after that, you need to move implement using lifting rear system. 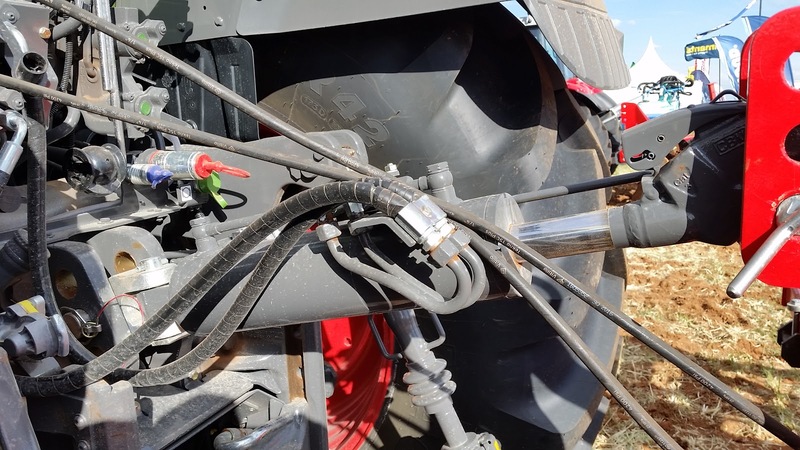 However, if your tractor has electronic hydraulic valves, working with hydraulic top link is truly easy. As you can see in our pictures, when tractor has electronic hydraulic valves, they has buttons on the fins which allow us to fix the hydraulic top link easier. We would like to highlight Valtra tractors have an independent hydraulic pump for working with hydraulic top link as you can see in our pictures number 19 and 20. In the moment that you decide to buy a hydraulic top link you need to know a few important parameters. Of course, the main parameter is the tractor power and you could buy it with only this information but if you know more details your purchase will be more satisfactory. You can information about hydraulic top link on these shops: Traxco, Alternativaagricola and Repuestos Fuster.